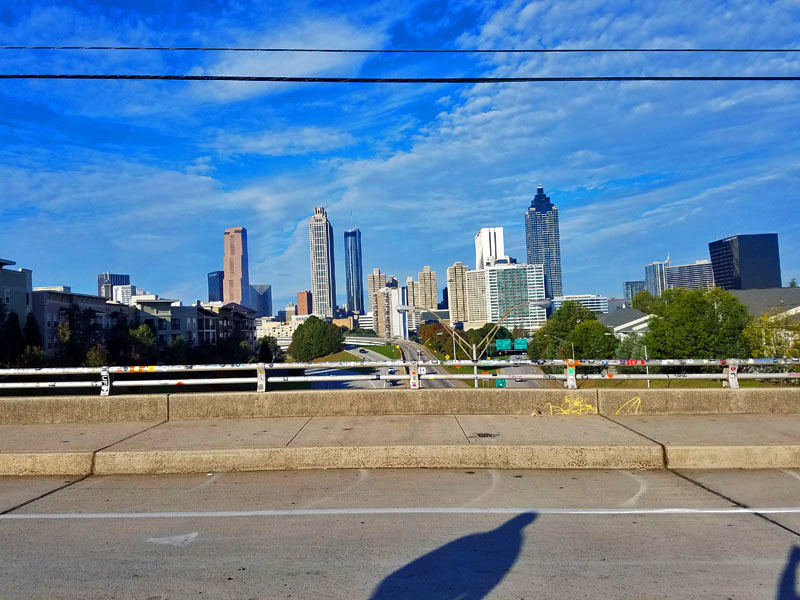 It was a recent Fall morning in Atlanta. My brother and I were heading to Condesa Coffee in the Old Fourth neighborhood. I had been to this coffee shop and part of the city numerous times before. This visit would be different though. 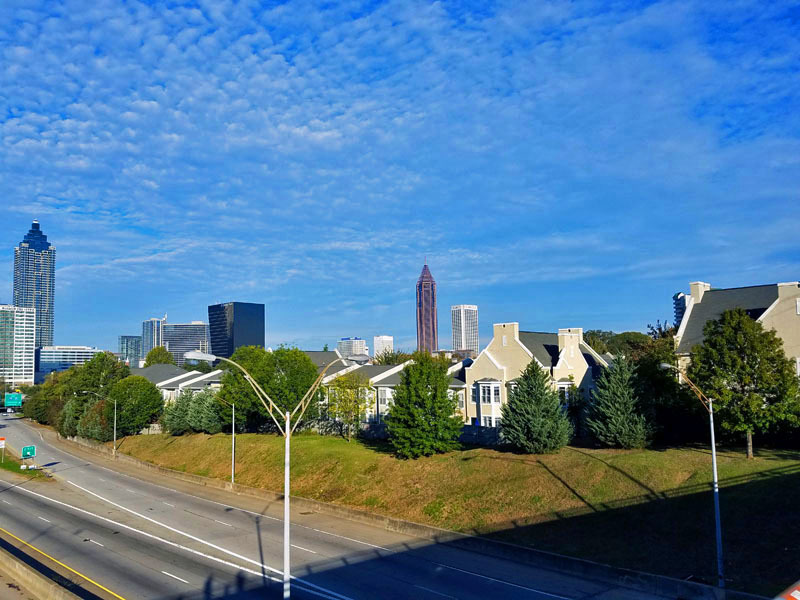 Condesa Coffee sits along Freedom Parkway, knowing that driving westward on gets you straight on shots of the Downtown Atlanta skyline. 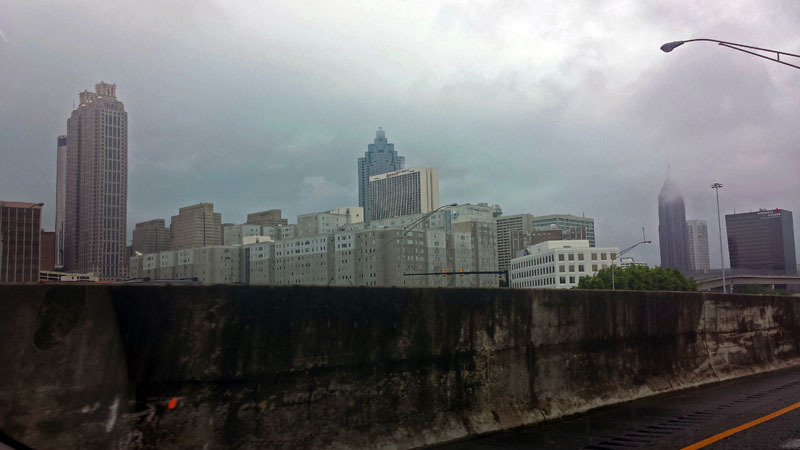 I’d always pass under the Jackson Street Bridge, a popular skyline viewing spot. Guess what? Until this very day, I had never driven or walked across that bridge. 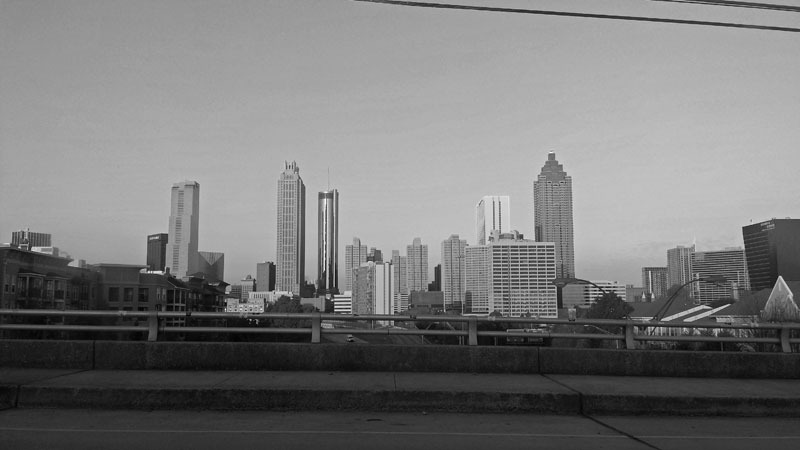 It was worth the wait, seeing a perfect shot of the Downtown part of the Atlanta skyline. I love how Freedom Parkway seems to sit perfectly in the foreground. It was just as beautiful as I had seen on so many Instagram posts. Many of you will recognize this scene as it’s a major part of the movie, “Walking Dead”. Being the morning, but past rush hour, traffic was limited on Freedom Parkway making it easier to get my camera in focus. 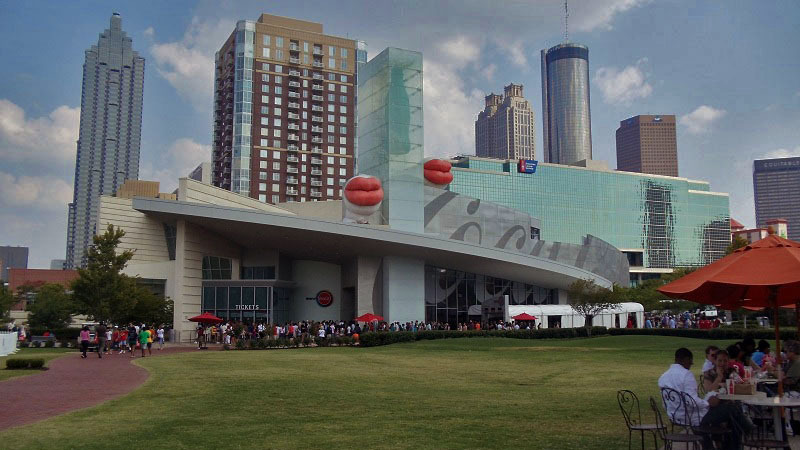 It definitely should be on your Atlanta bucket list. Looking off to the right, I was able to get a shot of the Downtown skyline with Atlanta’s tallest skyscraper, Bank of America Plaza, just off to the north. Tip: When going to Condesa Coffee I usually have no problem parking on John Wesley Dobbs Ave NE just east of Boulevard NE. Make the quick one block track over to the bridge via the Freedom Park Trail, which is something to experience in its own right. 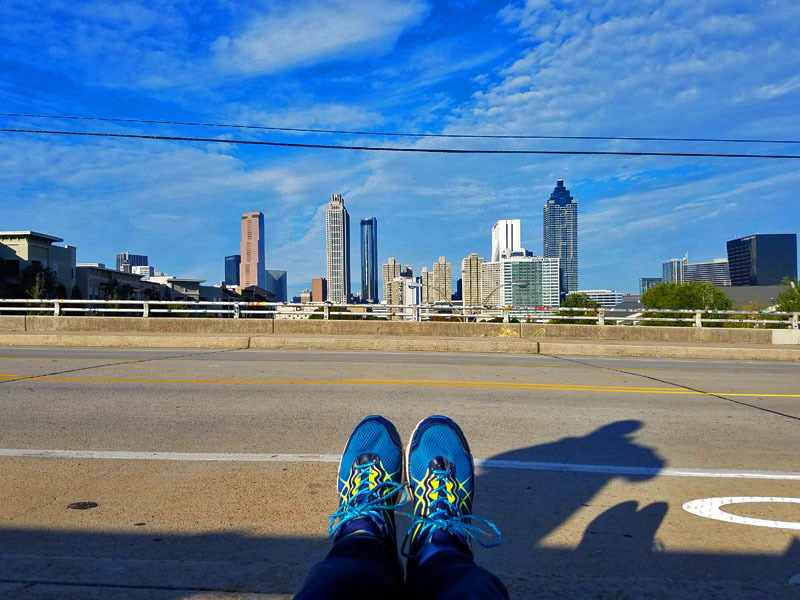 The perfectly blue morning sky made for a great first experience on the Jackson Street Bridge. I look forward to checking out the same view at night and on days with various cloud types in the future. 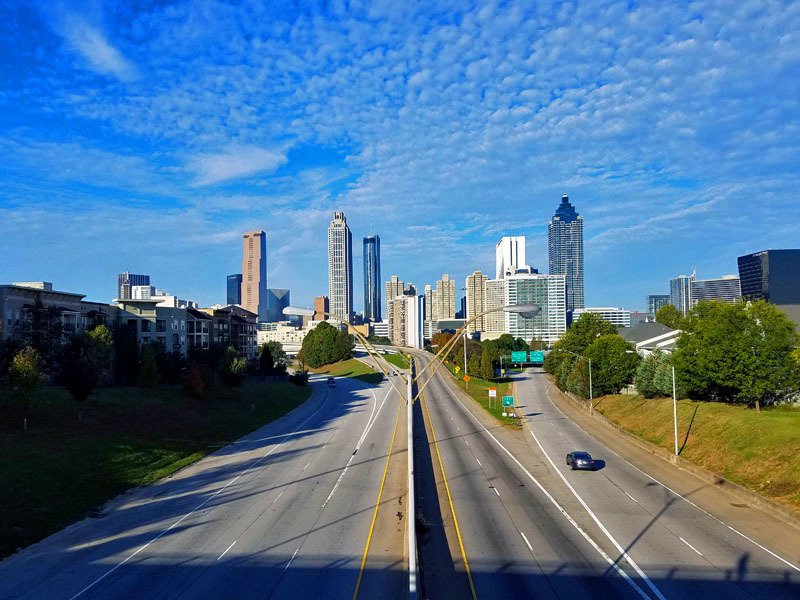 What other scenic spots would you recommend for checking out the Downtown or other parts of the Atlanta skyline? 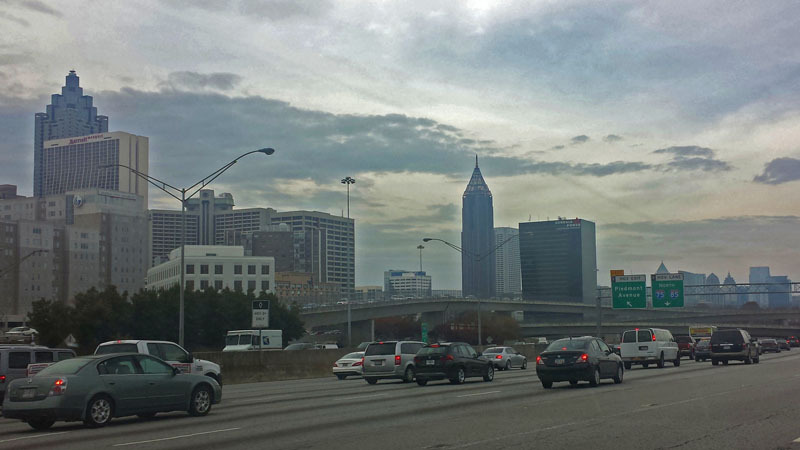 Atlanta: A Million Skyline Looks. 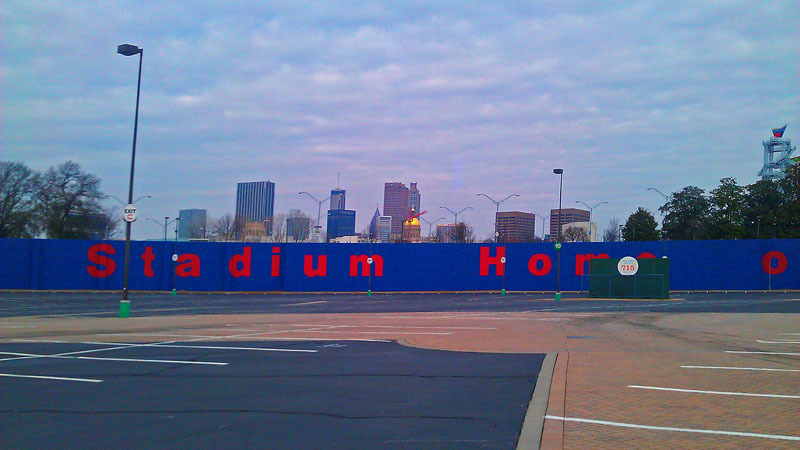 The skyline. 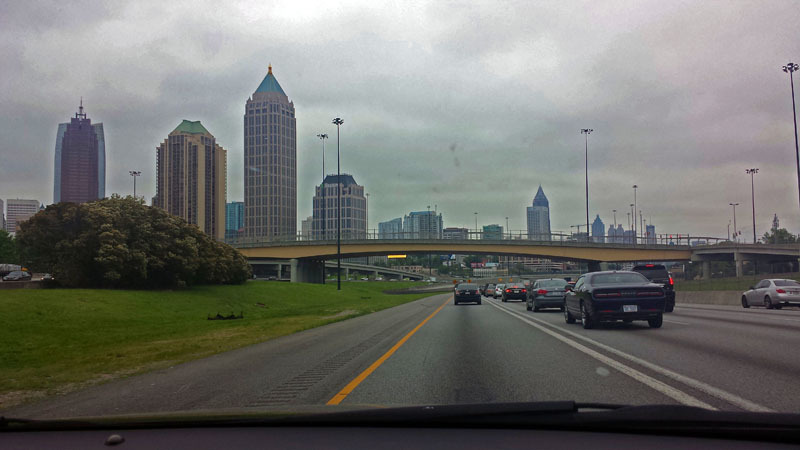 Anyone who follows me on this blog or on social media knows I like to capture city skylines. With that I got excited starting the A Million Skyline Looks series. 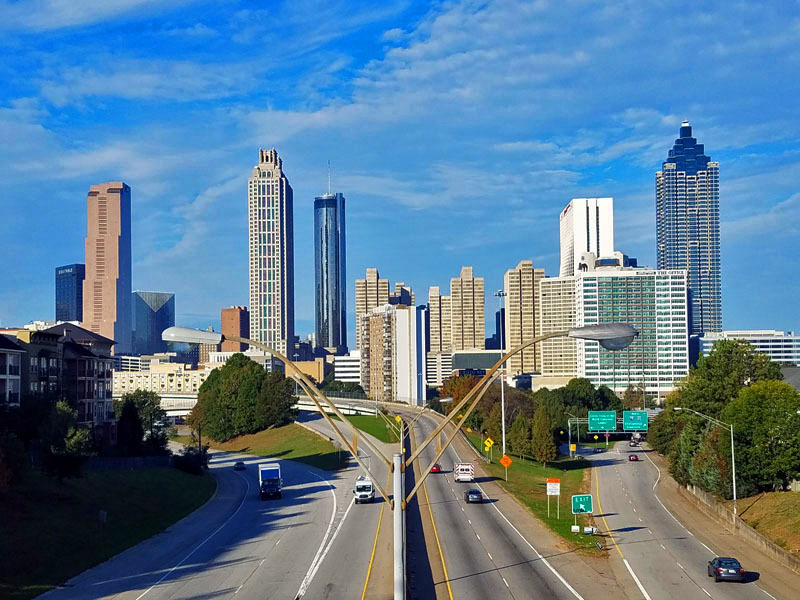 Toronto, Chicago, Auckland and now it is Atlanta’s turn. 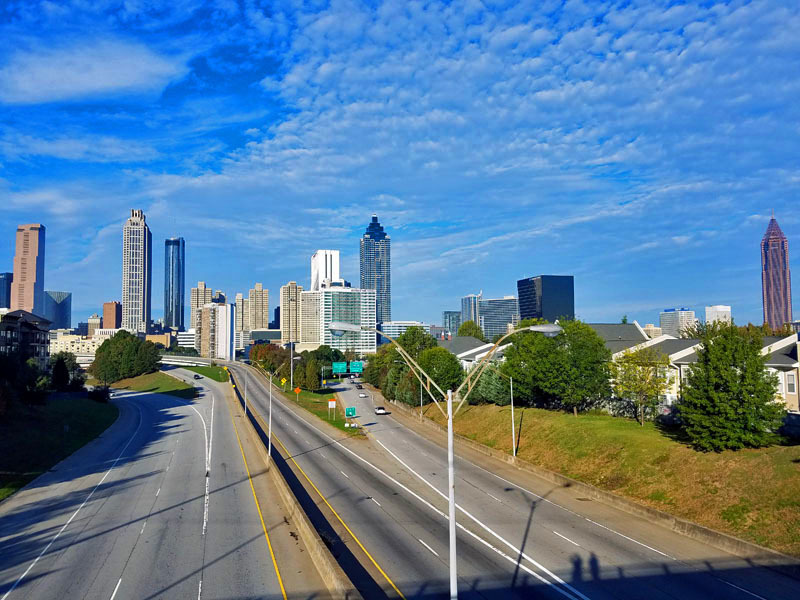 The unofficial capitol of the South has distinct skylines in both Midtown and Downtown. 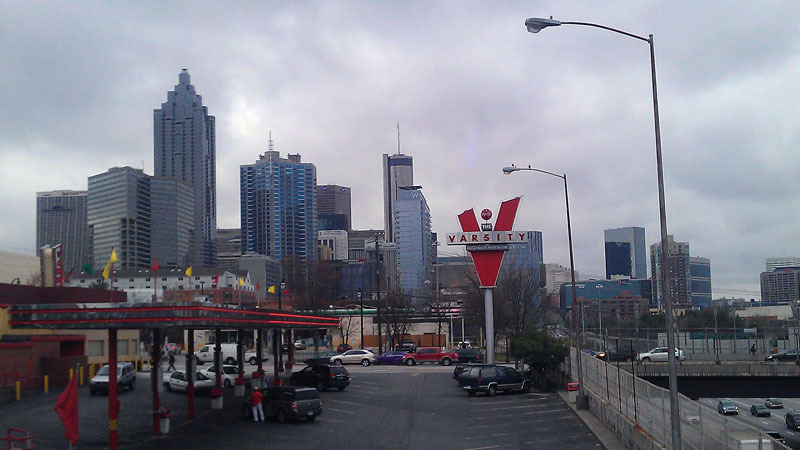 Eat a burger from this ATL institution, the Varsity, while capturing the city. 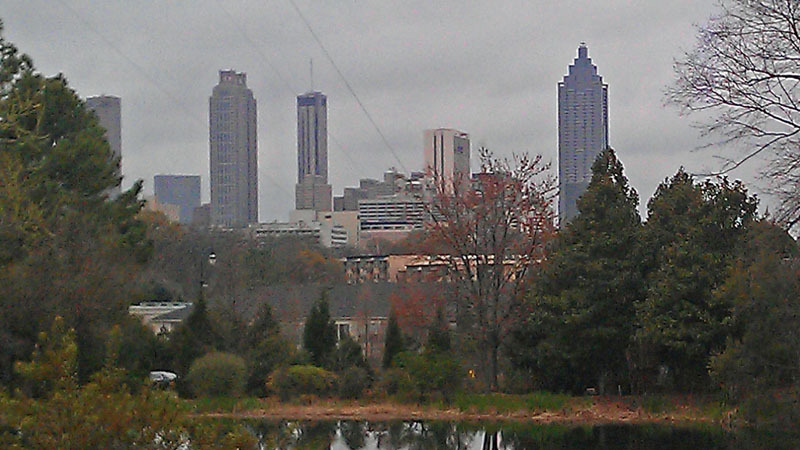 Sometimes random Atlanta city skyline shots just present themselves. 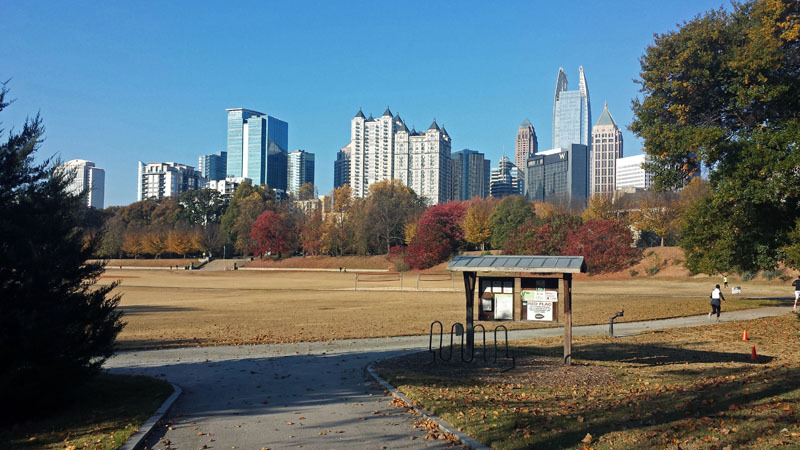 Head to the park behind the Jimmy Carter Library and Museum in the Poncey-Highland neighborhood. Skyline trying to peek out from the Jimmy Carter Library and Museum. 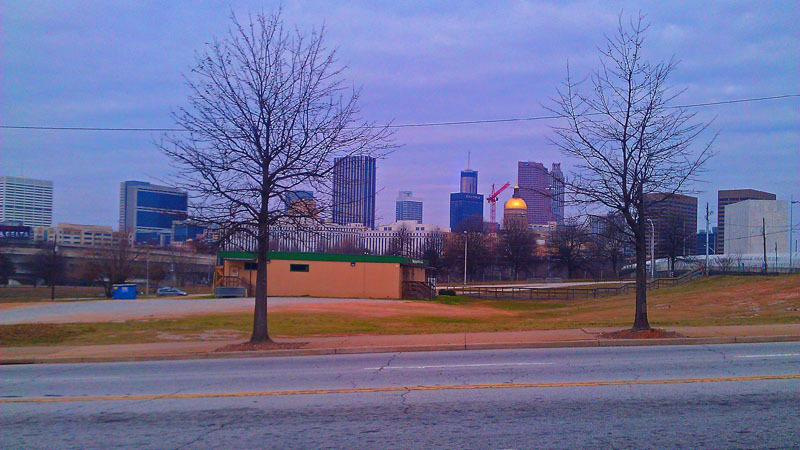 The Downtown skyline and state capitol from near Turner FIeld. 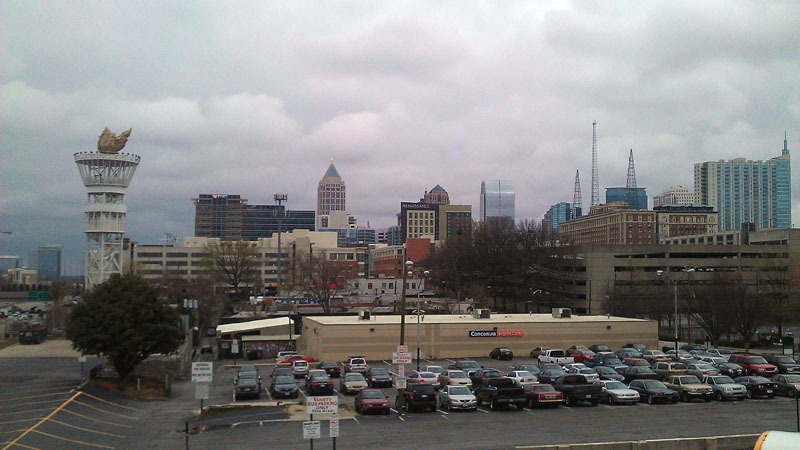 The Downtown skyline and state capitol from what was once Atlanta–Fulton County Stadium. Downtown helping to protect the World of Coca-Cola. 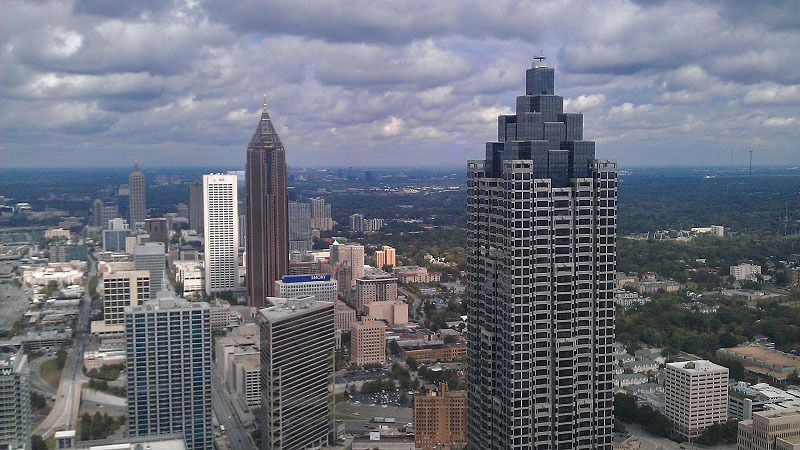 Midtown view from 73rd floor of The Westin Peachtree Plaza at The Sun Dial restaurant. 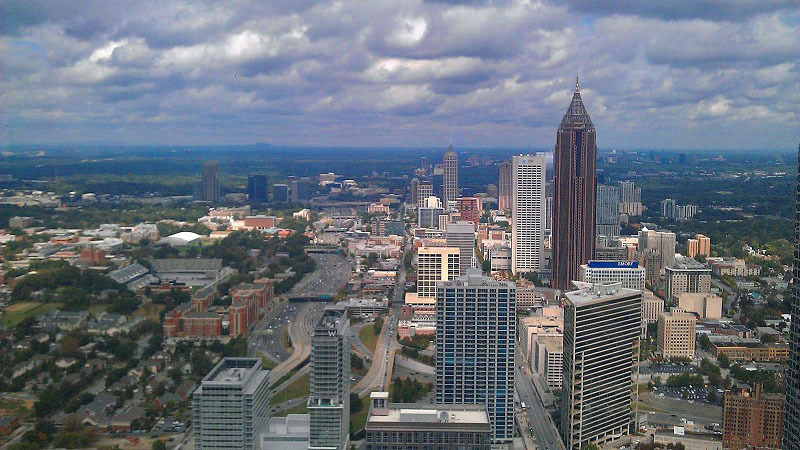 View from 73rd floor of The Westin Peachtree Plaza at The Sun Dial restaurant. 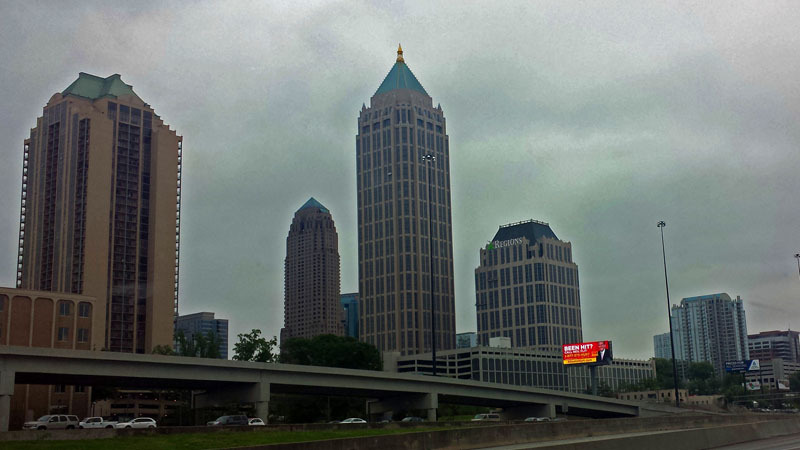 SunTrust Plaza is standing tall. Love looking straight up in a big city. 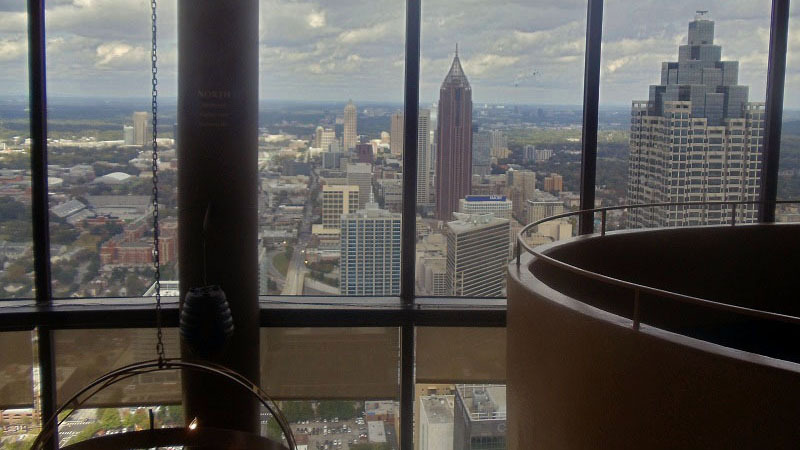 View from 73rd floor of The Westin Peachtree Plaza at The Sun Dial restaurant. 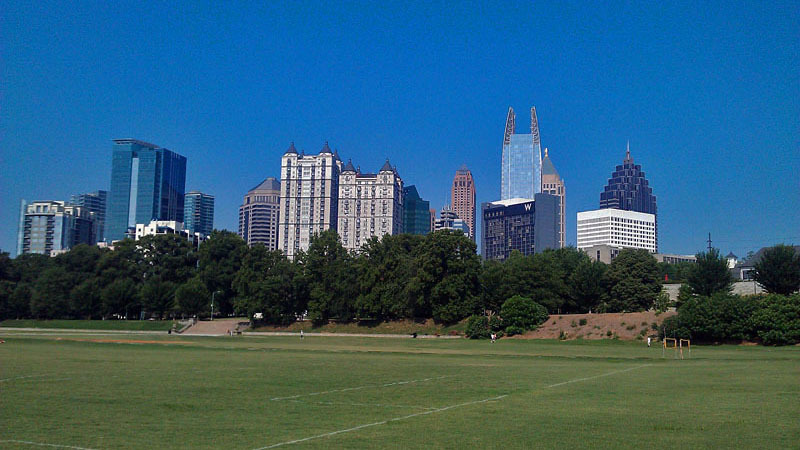 Midtown standing tall from Piedmont Park. 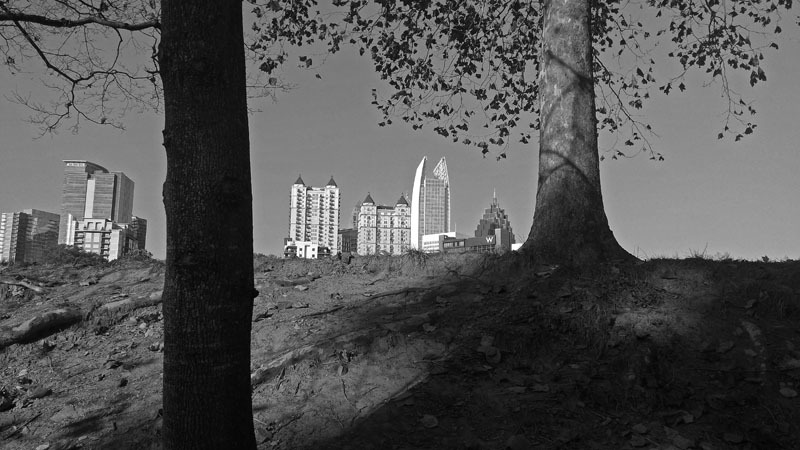 The skyline is playing peekabo in Piedmont Park. 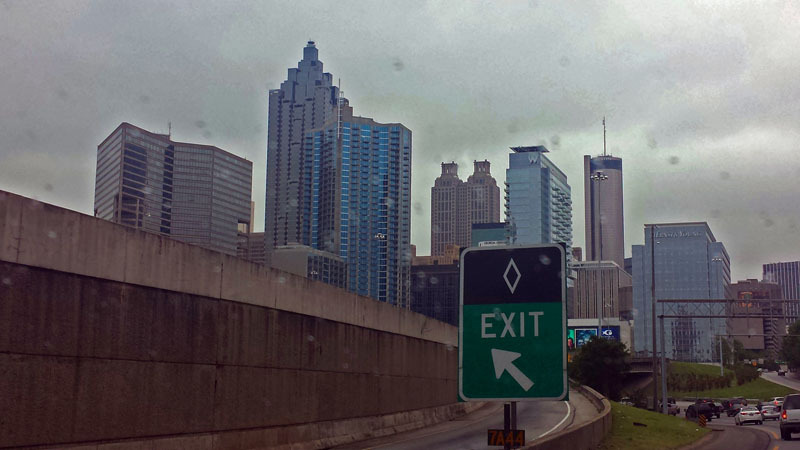 Exit for the Downtown ATL skyline anyone? 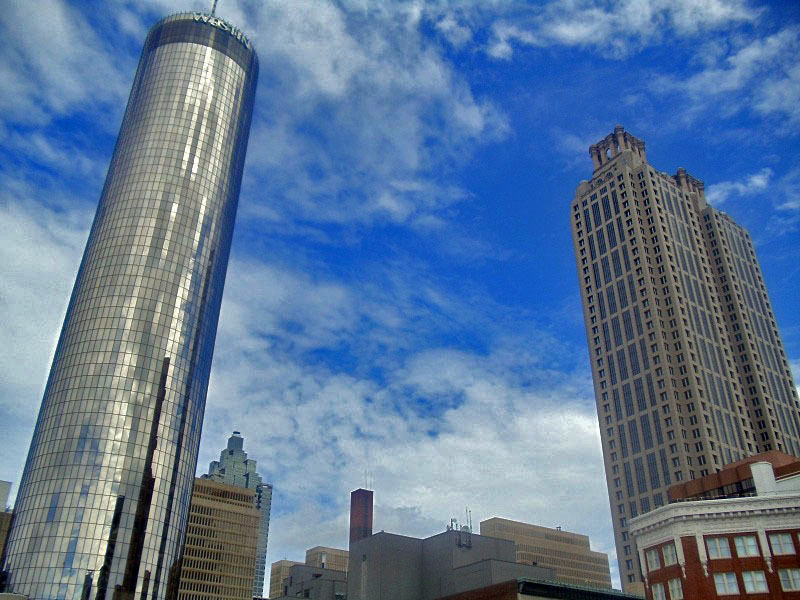 One Atlantic Center, the tallest building in Atlanta, standing in Midtown. 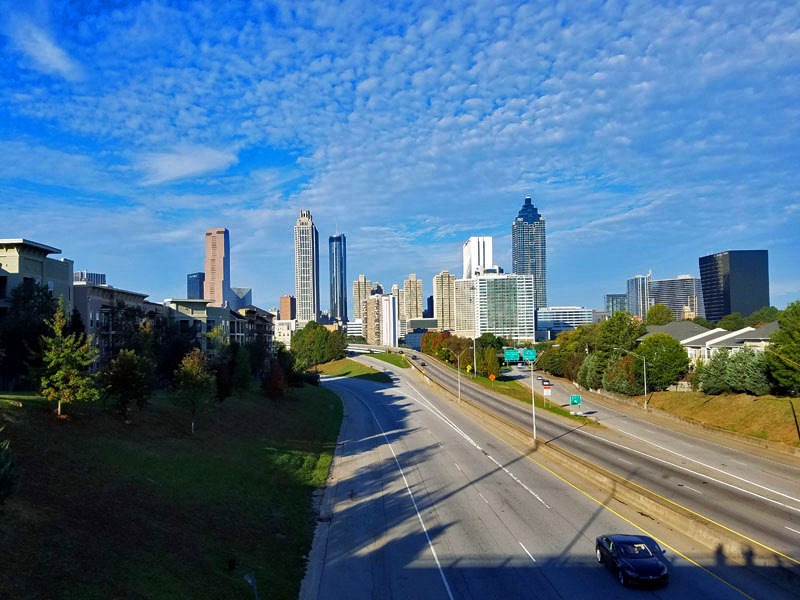 Heading right into the heart, northbound on the Downtown Connector (I-75/I-85). 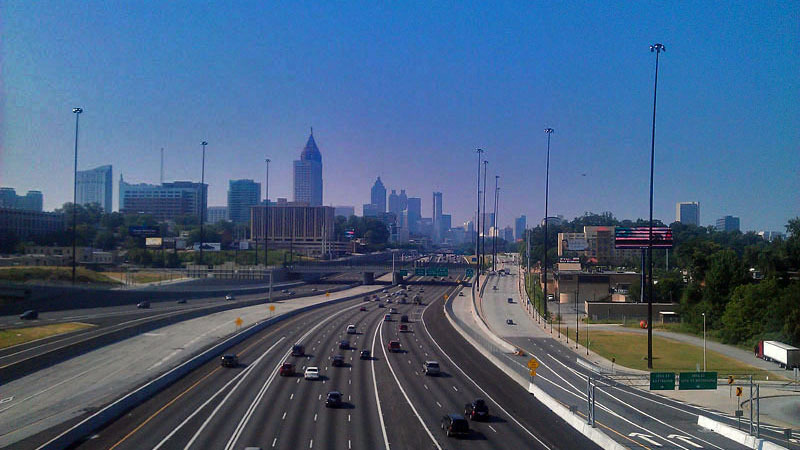 Heading southbound on the Downtown Connector (I-75/I-85). Skyline hugging the guard rail. Heading into the city from the south. 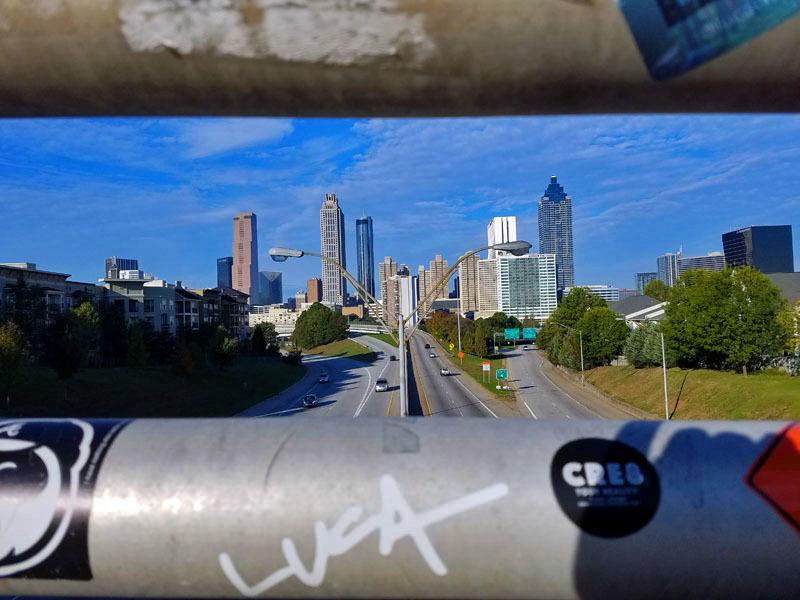 Can you see the Georgia State Capitol? 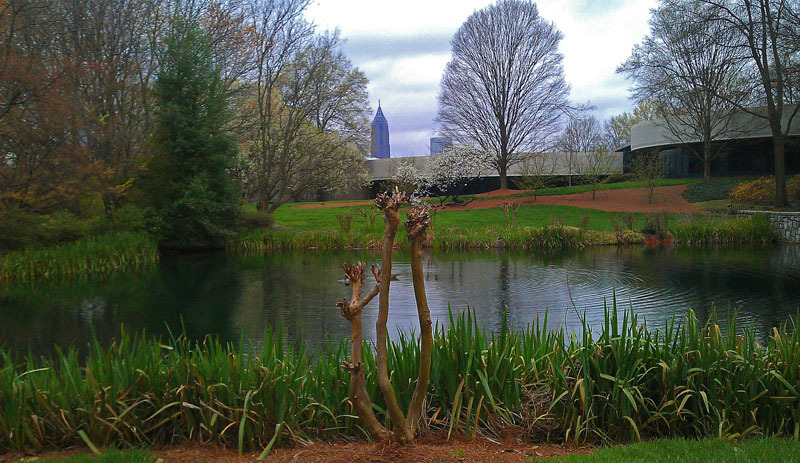 The pond and spot to grab a city shot within Piedmont Park. 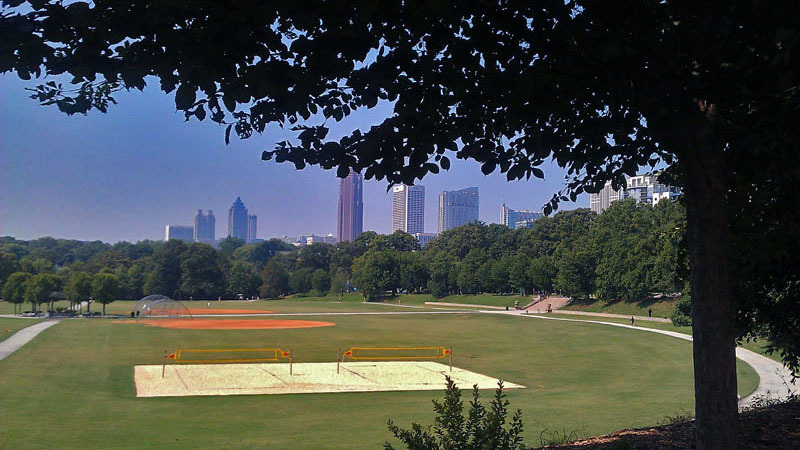 Midtown will greet you at the end of a climb in Piedmont Park. 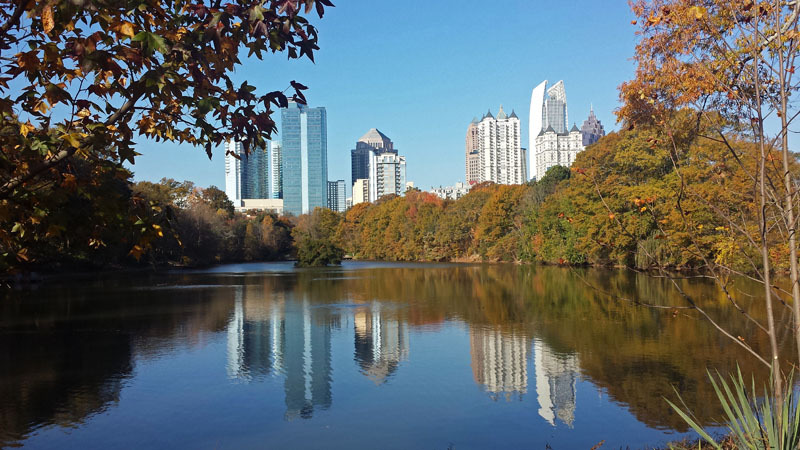 Midtown in Autumn, straight ahead at Piedmont Park. Good reason you think to pull off the road on Boulevard NE in the Old Fourth Ward neighborhood? 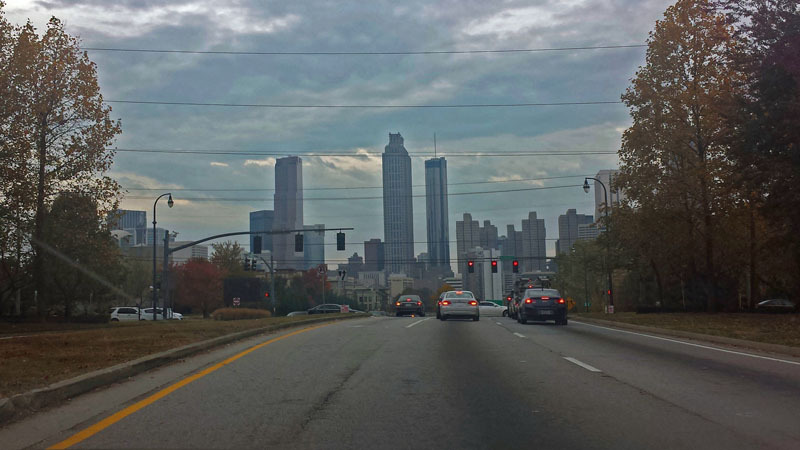 More Atlanta skyline opportunity out on the open road in Old Fourth Ward. 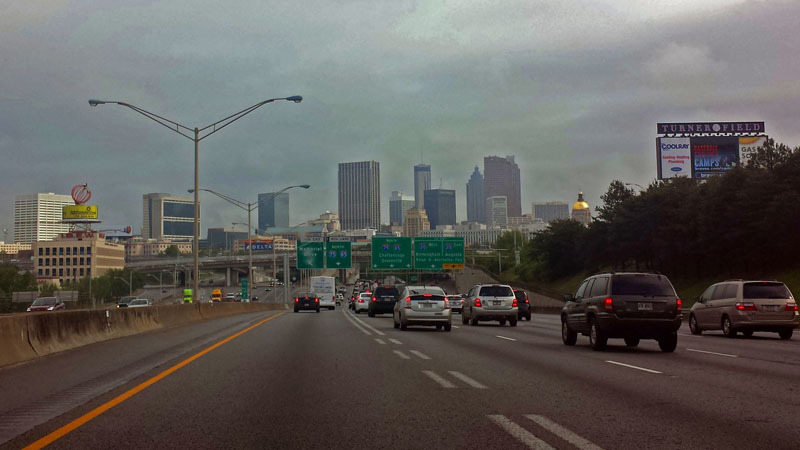 Heading off the interstate and into the heart of the Midtown skyline. 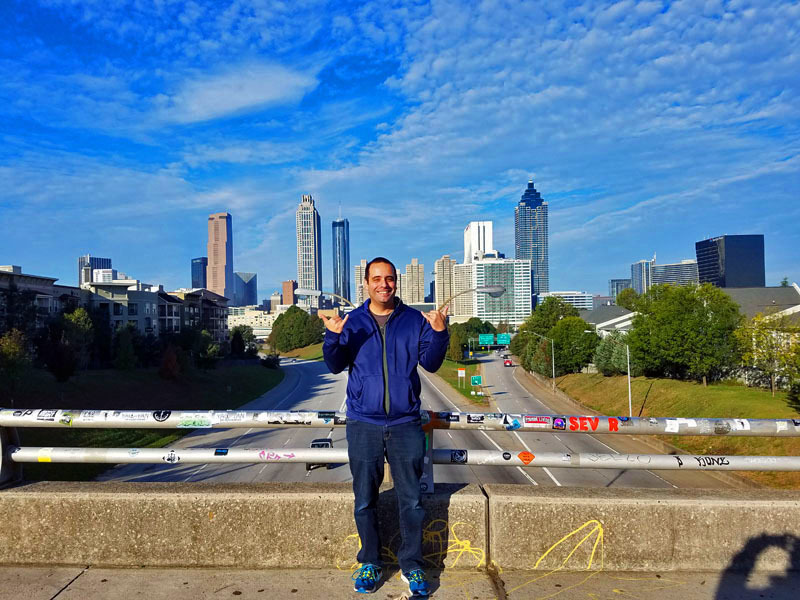 My favorite place to capture the ATL skyline is the 17th Street Bridge, my peaceful place. Many, many, many lanes heading into the city from the 17th Street Bridge. 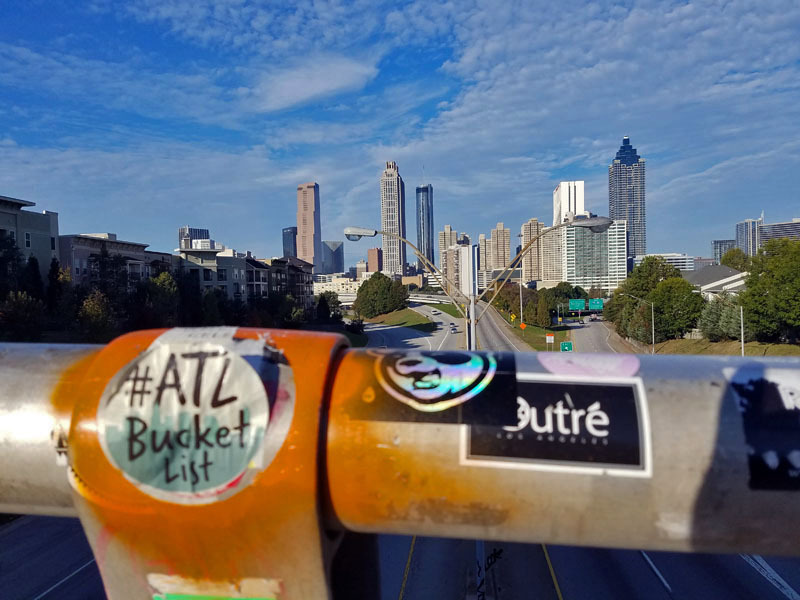 What other spots would you recommend capturing the Atlanta skyline from?